I like sweet and tart combinations. And to me, raspberries sometimes have that tart and tangy flavor. I like to pair that with something sweet which, in this case, was vanilla. 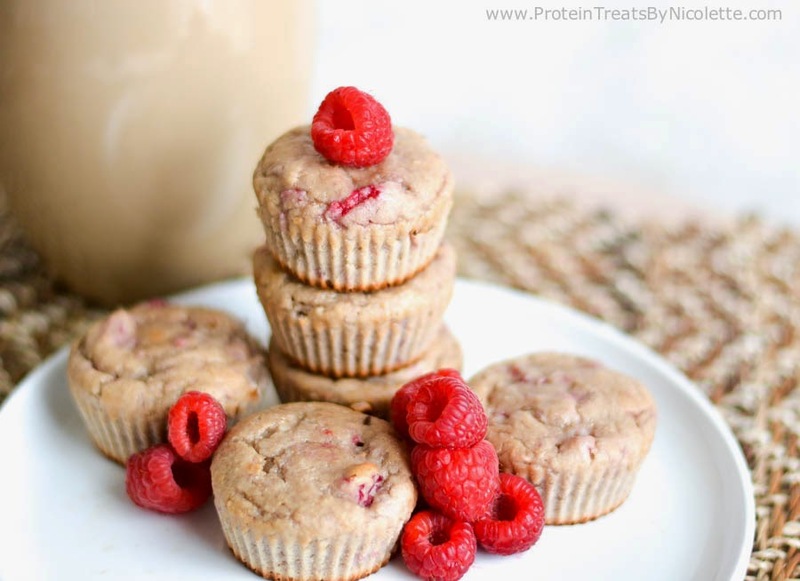 The vanilla protein powder I used in this recipe has just the right amount of sweetness to offset the tartness of the raspberries. The texture of these were really good, too! I almost added some melted white chocolate on top thinking that the added sweetness would be yummy. Listen, there's no way melted white chocolate would be bad or not good. But I will say that they are delicious without it also :) Enjoy! 1. Preheat the oven to 350 degrees F. Place 6 silicon muffin liners on a sheet pan. 2. 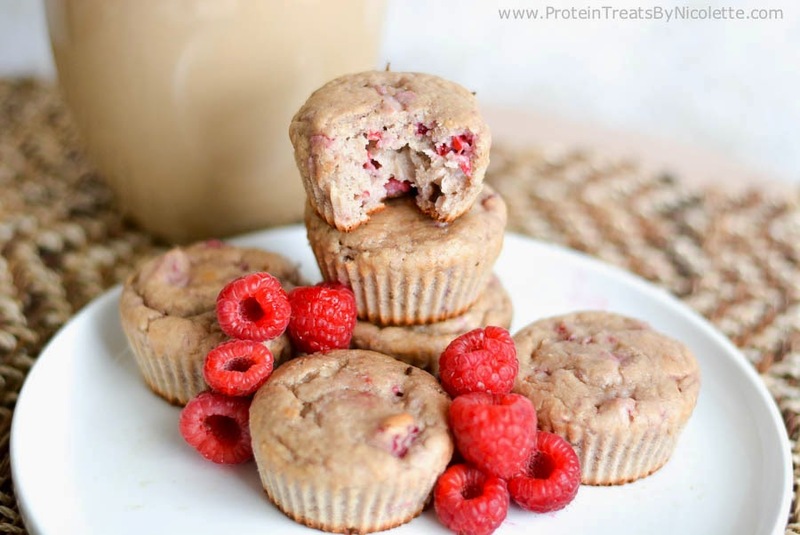 Add egg whites, ¼ cup raspberries, and almond milk to a blender or food processor and blend until smooth. 3. Add protein powder, almond meal flour, oat flour, xylitol, and baking powder to a mixing bowl and stir together. 4. Pour wet mixture into the bowl of dry ingredients and stir until well combined. Stir in the remainder ½ cup raspberries. 5. 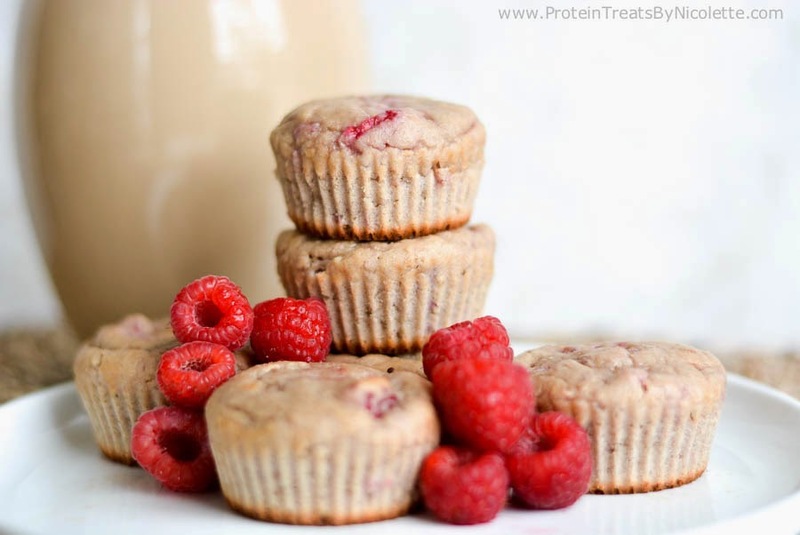 Evenly spoon batter into the 6 muffin liners and bake in the oven for 18-22 minutes. Enjoy! * You can use regular cupcake liners. Make sure to coat them with non-stick spray before adding the muffin batter. 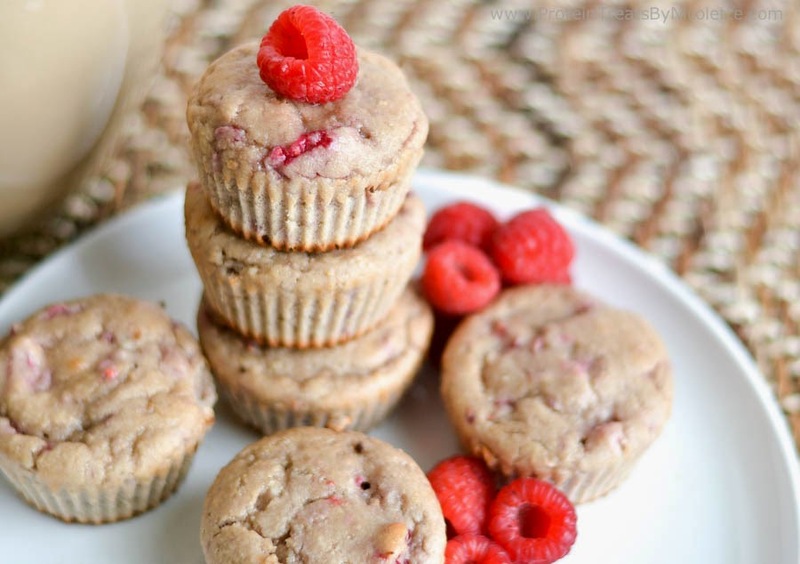 * You can also make these into mini muffins. Decrease the cooking time to 10-14 minutes. I don't have almond meal or almond flour, is ther something I can substitute for this like more whole wheat flour or coconut flour? Yes. You can use oat flour or whole wheat flour. I would not recommend using coconut flour as a replacement, though. This looks great! 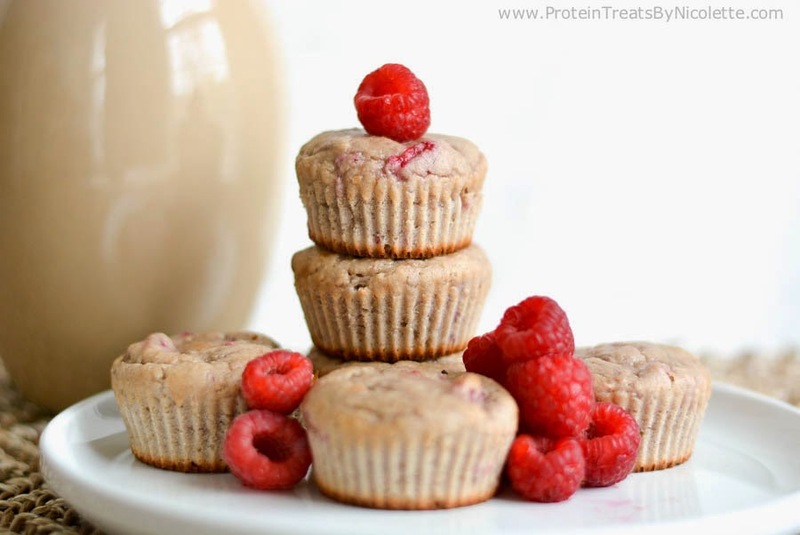 Gotta love your protein pastries! Can I use normal milk and flour instead of the almond?? Yes. Use the same amount of regular milk but only try 1/4 cup regular flour. I would try honey or agave. I'm so sorry I am just now seeing this. I feel terrible! Yes, so one scoop will equal to 1/4 cup :) I hope this helps! Have New Recipes Emailed Directly To You! All content provided on www.proteintreatsbynicolette.com is for informational purposes only. The information and recipes on this blog are for general information only and are not intended to be a substitute for professional medical, nutritional, or dietary advice. The owner of this blog makes no representations as to the accuracy or completeness of any information on this site or found by following any link on this site. Please seek approval of a licensed professional before proceeding with any new diet plan. Copyright ©2014 www.proteintreatsbynicolette.com. Unauthorized use and/or duplication of any material, including but not limited to images and recipes, without express and written permission from this blog’s author and/or owner is strictly prohibited. All photos, recipes, images, and descriptions on this site are protected. 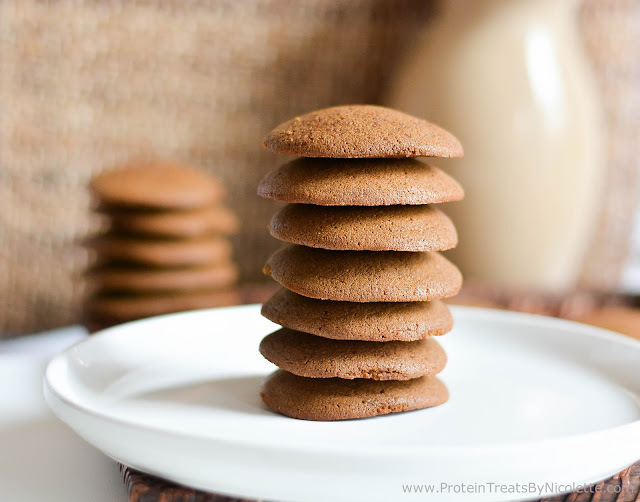 Protein Treats by Nicolette. Powered by Blogger.